US Airways Magazine names Holiday World the world's 'Best Park for Merrymakers' in its October issue. A top in-flight magazine named Holiday World & Splashin' Safari the world’s “Best Amusement Park for Merrymakers” in its October issue. In US Airways Magazine’s “Hot Spots: Great Getaways” section, six parks from around the world were named “best” in categories ranging from “Best for Daredevils” to “Best for Partiers.” Holiday World’s Voyage roller coaster was listed as a “Don’t Miss” ride. US Airways Magazine’s monthly readership totals more than three million. Holiday World & Splashin’ Safari are closed for the season. 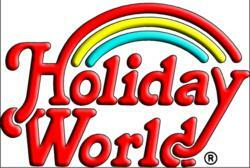 For more information about plans for 2013, including the new RhinoBlaster and Kitty’s Tea Party, visit HolidayWorld.com.